There are 2 versions of the F3 available, differing only in the console. Here we test the top of the line model with the fully-loaded ‘Track’ console. The F3 looks expensive and the high quality is very price appropriate too! It’s as solid and heavy as an 24 karat rock and capable of carrying a 25 stone user! For added reassurance there’s an extensive warranty with a Lifetime on the frame and Lifespring™ shock absorbers, 10-year on the motor, and 3 years on all parts and labour. The F3 has a 3.0 Horsepower Continuous Duty DC MagnaDrive™ Motor System which is every bit as good as you’d expect from any Life Fitness machine. It’s certainly smooth and the power is good for the most part so it comes as rather a surprise (and perhaps a disappointment) that it doesn’t exceed a 10 mph top speed. 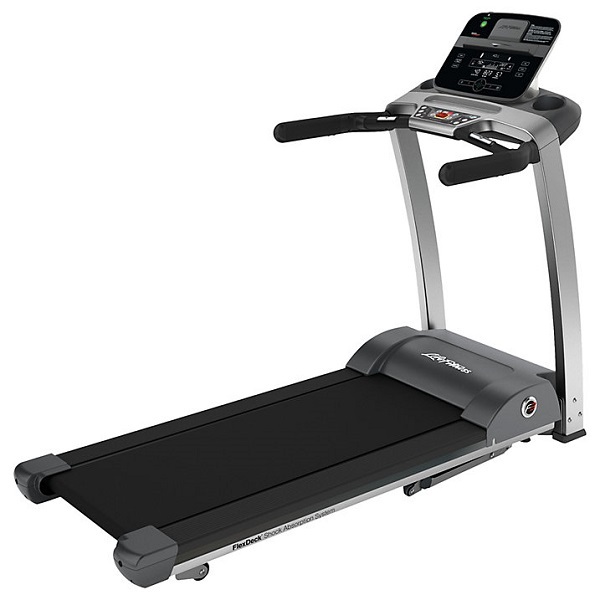 It was fairly quiet in use, right up to the point it was running at full whack at top incline but our concern was not the level of volume but rather the level of incline – it maxes out at 12%. At this price point we are used to seeing 15% gradients and 12 mph top speeds. Once we experienced the cushioning system, we were all smiles once again! The Flex Deck is one big reason for Life Fitness’ treadmills massive popularity and their presence in gyms around the world. It’s said to reduce the impact of running by around 30% so we were delighted to see and FEEL it on this residential model. 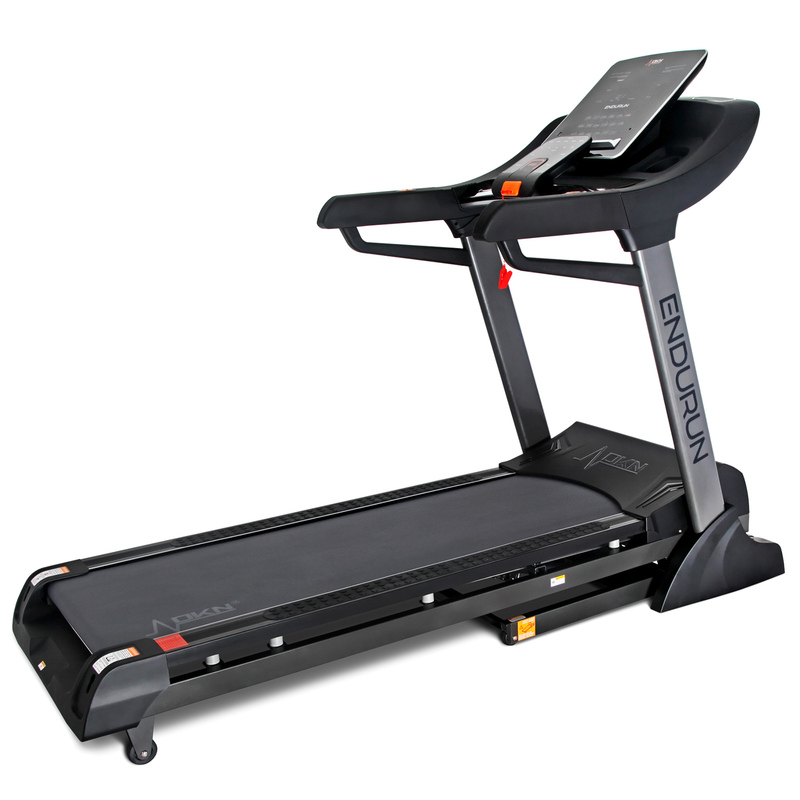 Although tall users may possibly find the 55” x 20” running area slightly shorter than many other high-end machines, the actual surface you’re running on should make up for the slight ‘shortcoming’ in length! Although feature-rich, the Track console is fairly intuitive and it doesn’t take long to become familiar with its functions. 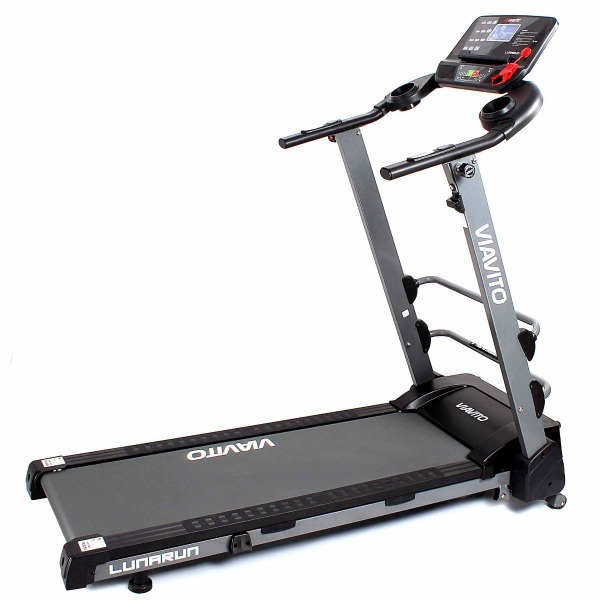 A great example of its user-friendly design is in the quick keys that make instant adjustment to either speed or incline. 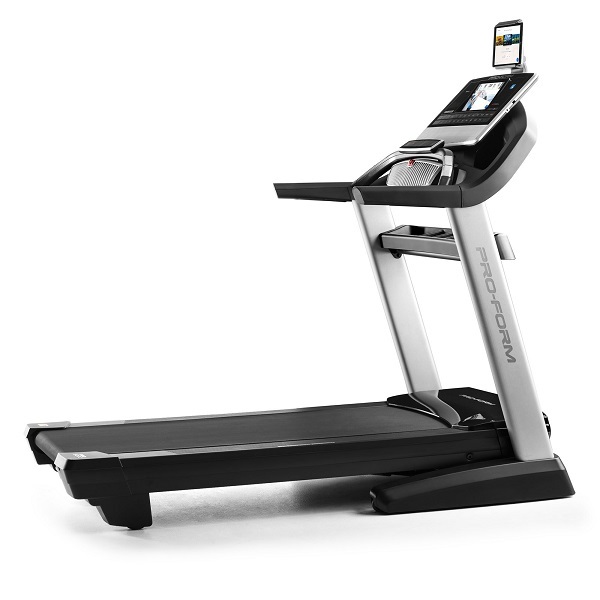 You have 3 buttons for incline marked ‘low, medium and high’ and speed is just as simple with ‘walk, jog or run’ being the pre-set options. As standard the speed buttons go up in 2mph increments from 2 to 6 mph but these can be programmed to be pre-set to your very own personal requirements that is a real bonus for things like interval training. The incline is also set to be a little on the cautious side (1.5% (Low), 3% (Mid) and 5% (High) so it’s useful that users can alter these pre-set values too. There are pulse grip sensors on the handlebars, which give some degree of accuracy to basic heart rate readings, but we strongly recommend using the wireless chest belt transmitter that’s included. Not only can you guarantee much greater accuracy of feedback but you’ll also be able to enjoy the host of heart rate functions that’s available via the chest strap and the clever Track console! There are an excellent array of 14 inbuilt pre-set programmes. You’ve got fairly standard sessions such as ‘Manual’(self-explanatory! 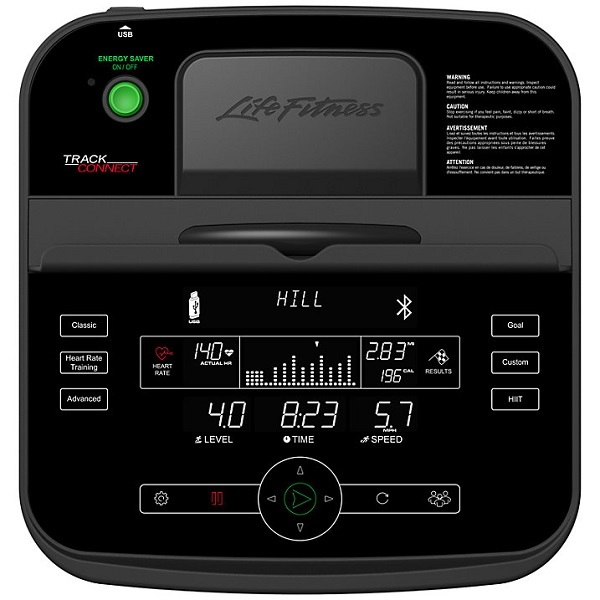 ), ‘Hills’ (which is based around interval training) or ‘Random’ (which are unique courses taken form over 1 million possible combinations of course patterns) but where the Track console really excels is when it’s combined with a wireless chest strap (included). You can then enjoy 5 different heart rate controlled sessions. 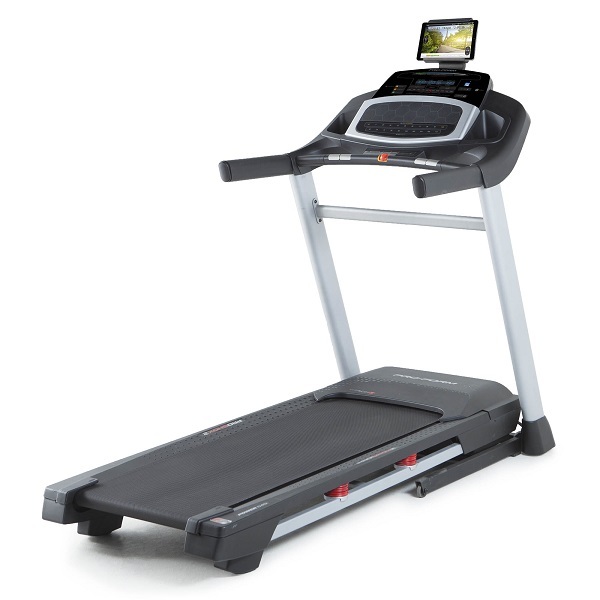 There’s ‘FAT BURN’ where the treadmill adjusts the incline automatically or messages you to alter the speed so that you remain in the ideal fat-burning zone of around 65% of your maximum heart rate. If you want to improve your fitness levels then there is also a ‘CARDIO’ session that keeps your heart and lungs pumping around the 80% THR zone. To challenge your fitness even further there is a heart rate Hill workout. After you’re taken through a warm-up period it’s time to tackle the first ‘HILL’ which is where the treadmill adjusts the incline to get your heart rate up to 70% of maximum. Once there, it keeps the intensity the same for 1 minute before it reduces the incline down until your heart rate drops to 65%, then it’s time to simulate the next steeper ‘HILL’! The process is repeated a total of 3 times but each time the incline rises to take your heart rate to 75% and then 80% of maximum respectively before you commence the cool down phase. It’s clever stuff and as you get fitter more ‘HILLS’ (intervals) are added! When you get EVEN fitter, the Heart Rate Interval workout offers even more challenges! This is similar to the HR Hills workout except the ‘HILLS’ are designed to keep you at 80% of your maximum for 3 minute periods before dropping things down until your heart rate is at 65% and then the ‘fun’ starts again! The ‘Extreme heart rate workout’ as the name implies is for the more serious trainers (and useful for those trying to break through fitness plateaus). This session is rather like sprint training in that it mixes up short 20 second intervals taking your heart rate between 65% and 85% in bursts of intensity. To see how all of these workouts actually improve your fitness level there is a ‘FIT TEST’ feature that monitors your rate of recovery immediately after a workout and gives you a score. In addition to all of those heart rate controlled sessions there is also a Target heart rate workout as part of the ‘Goals’ settings. It’s rather self-explanatory but in this instance you simply set a Target heart rate and the machine keeps you in the zone for the duration of the workout. This type of session can also be based around a pre-set calorie consumption figure or a distance to be covered and the machine will keep you going until you’ve achieved your goal. You can also use Target heart rate training in custom workouts too. The Track console gives you the option of creating 3 custom workouts per user profile and there are four user profiles – The maths is simple but rather impressive – that’s 12 possible custom made unique workouts! We’ve given an overview of just some of the programs but the most distinct difference between the ‘Track’ console and the cheaper F3 with ‘Go console’ is that this model gives scope to add loads more programs and more via the USB port. The Life Fitness website’s ‘Virtual Trainer’ allows you to download and even customize a huge selection of programs. By using the USB port on the console you can also upload the results from your workouts and track your progress on a monthly graph on the website. Another unique feature of the Track is the iPod compatibility. Unfortunately there are no inbuilt speakers or MP3 input but if you’ve got an iPhone and iTouch or a Nano, you can charge the device on the dock and control the functions down on the sweat-resistant key pads on the console while listening through headphones via the consoles jack plug. 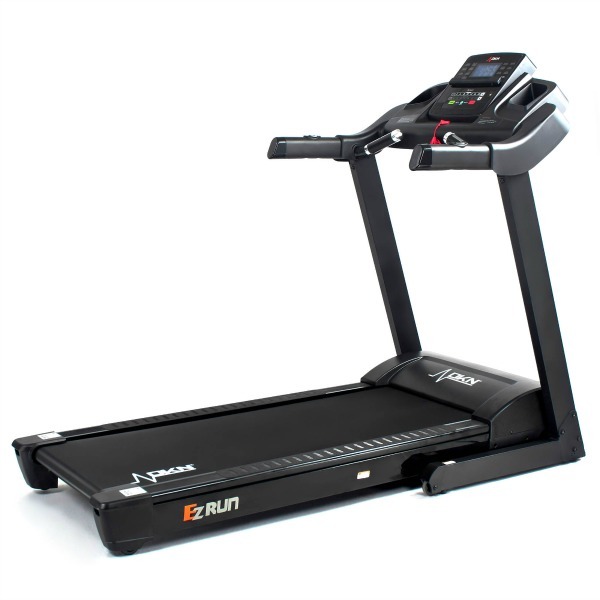 Perhaps one of the most appealing features of the F3 in general is the fact that you’re getting a top quality Life Fitness running machine that is foldable. The deck lifts fairly comfortably despite it’s substantial weight and folds up neatly for storage. The unlocking lever design should also appeal, especially to parents who will get peace of mind from having the hand-release lever mounted high up on the underside of the deck. Overall we really rate the F3 treadmill. It’s really down to personal preference whether you would use the Virtual Trainer accessibility and iPhone/iPod compatibility enough to justify the extra 200 quid for the Track console. However, regardless of which console you go for, you’ll be getting a durable, high quality machine with plenty of super-effective inbuilt programs as standard. 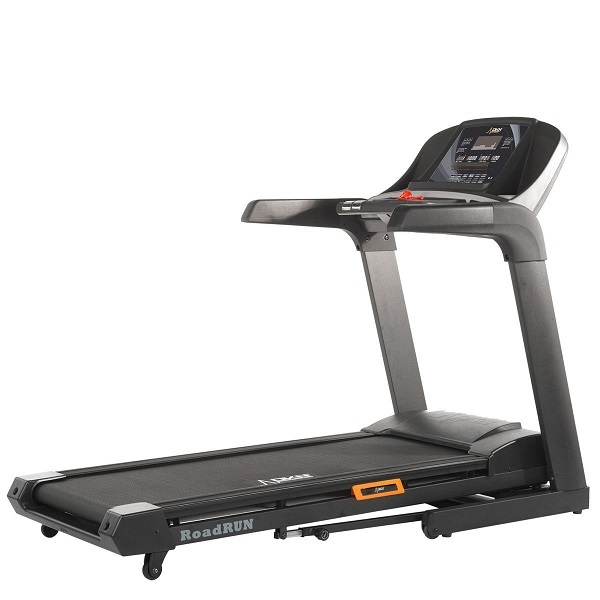 A very high quality treadmill taking up less that one square meter of floor space when folded. 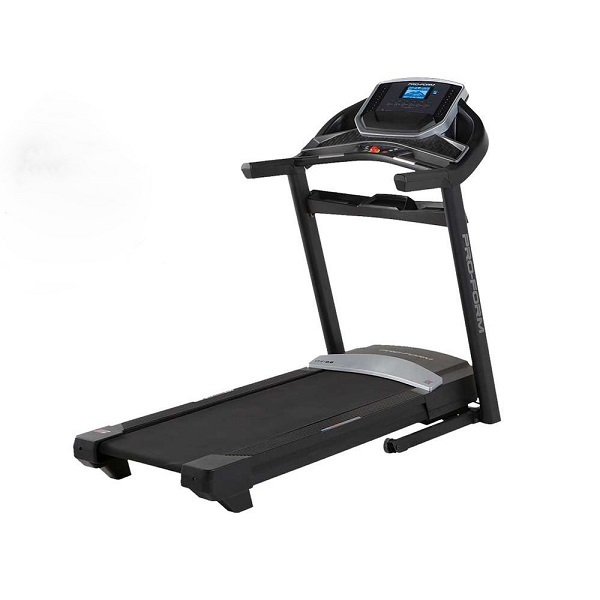 Premium components, design and innovative and effective cushioning technology makes this a good contender for those seeking a very premium quality, compact sized treadmill. However, if you've got the space, be sure to have a look at the Proform Pro 5000 running machine - one of the best machines currently available in the UK!